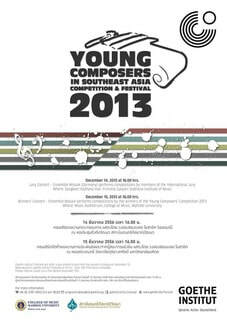 The Young Composers in Southeast Asia Competition and Festival 2013 was held at the College of Music, Mahidol University and Princess Galyani Vadhana Institute of Music (PGVIM) from December 9-15, 2013. It was jointly organized by the two institutions and the Goethe Institut. There are mainly three components to this event – lectures given by the established jury (Dieter Mack, Jonas Baes, Michael Asmara, Chong Kee Yong, Chung Shih Hoh, Anothai Nitibhon and James J. Ogburn), workshops for young composers(1), and two concerts. During the first couple of days, young composers divided their times between attending lectures and rehearsing their pieces with Ensemble Mosaik(2) and traditional musicians(3). The jury shared their – at times provocative and personal – musical thoughts and experiences working with musicians and working within certain environments. It was a little unfortunate that the jury had to initiate most of the questions as their lectures were meant to stimulate discussions among young composers. Meanwhile, based on the inputs from other young composers, I gathered the rehearsals with Ensemble Mosaik went really well. On the third and fourth day, the jury joined the young composers in their rehearsals with Ensemble Mosaik, entailing the format of the rehearsals to resemble a workshop. Many interesting topics were touched on during the workshops, one of which was the inclusion of non-Western instruments in Western notation-based music. 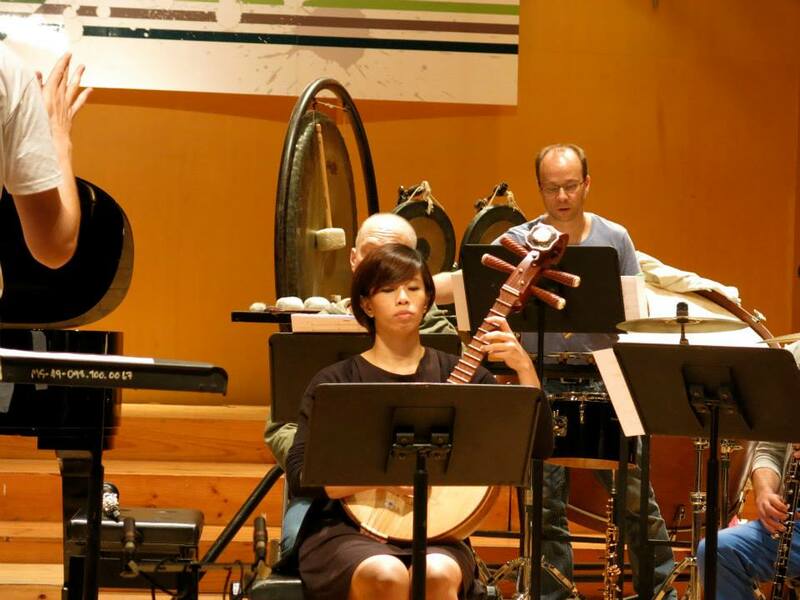 This festival saw the use of a wide array of non-Western instruments, including Guzheng (Chinese zither), Dan Bau (Vietnamese monochord), Saw Au (Thai two-string fiddle), etc. According to the jury, there was often a balance issue in some of the compositions with a mixed milieu because Western instruments, which are usually louder in nature, tend to be sonically more dominant. They also suggested using alternative notational systems for traditional instruments if the traditional musicians are not used to reading Western notation or when the parts for the traditional instruments are not written to portray a soundscape that resembles that of a Western ensemble. The following day was spent sightseeing around the Nakhon Pathom area, visiting places such as the Phra Pathom Chedi and Don Wai Market. Two amazing concerts were staged during the weekend – last two days of the wonderful festival. On Saturday night, Ensemble Mosaik performed music by the jury composers and Enno Poppe at Sangkeet Vadhana Hall, PGVIM. In addition, Wu Wei, a well-known sheng virtuoso, was the featured soloist in Chong Kee Yong’s piece, “Phoenix Calling”. It was a highly moving concert. The energy exuded by the composers through the ensemble was electrifying: the air was steamy with musical vitality. At one point, the music even left the pianist in tears. On the finale night, 10 pieces of music by the finalists - four of whom were SMCC members (Ainolnaim Azizol, Tee Xiao Xi, Yeo Chow Shern and Zihua Tan) - were performed at the Music Auditorium, Mahidol University. The myriad musical styles as heard on that night were proof that Southeast Asia is a multifaceted region and home to many talented young composers. Three winners were named at the end of the night, namely: Kongmeng Liew, Yeo Chow Shern and Zihua Tan. On a personal note, I strongly recommend young composers to participate in this biannual festival – next edition will take place in 2015 – if they get the chance to do so. It is simply a luxury for young composers to be able to study with distinguished composers in the region and Germany and have their music performed by an extraordinarily perceptive and technically impeccable ensemble. Young composers are also free to schedule private lessons with the jury members. On top of that, for this edition, at least, excellent food and accommodation were provided by Mahidol University and the Goethe Institut throughout the whole week. At the risk of nit-picking, there is a potential room for improvement in the area of technical support, in terms of setting up the stage, moving the equipment around, and arranging certain logistics. Also, perhaps a greater publicity could have been made to ameliorate the slightly low audience turnout –composition students and the faculty of the university, for example, could be exhorted to partake in the event. Lastly, while young composers showed a lot of promise, we could probably be more proactive in voicing out our thoughts on the new music practices in Southeast Asia and the world in general, as well as our plans and aspirations in developing the new music scene in the region. All in all, what a fantastic festival it was. The camaraderie shared amongst the musicians is something I will always treasure. And if there is anything that defines the Southeast Asian “voice”, it ought to be the great sensitivity in treating all kinds of sounds as heard in the music presented during the festival.